The National Domestic Women Workers Union (NDWWU) was established on March 8, 2001 with the aim of recognizing the rights and establishing the dignity of Domestic workers. NDWWU is the first domestic workers union in Bangladesh. Formed in 2012, CDWN aims to attain 1,000 members by 2017, including migrant Cambodian domestic workers in Malaysia. FADWU is a union federation composed of local and migrant domestic workers unions in Hong Kong of different nationalities. The GKS is organizing domestic workers in Gurgaon, an industrial and financial centre next to the capital Delhi. Formed in 1985, NDWM has been organizing domestic workers and promoting for their rights. It is now currently working in 17 states all over India. It further established National Domestic Workers Federation (NDWF) in 2013 to get domestic workers more organized into trade union structure. 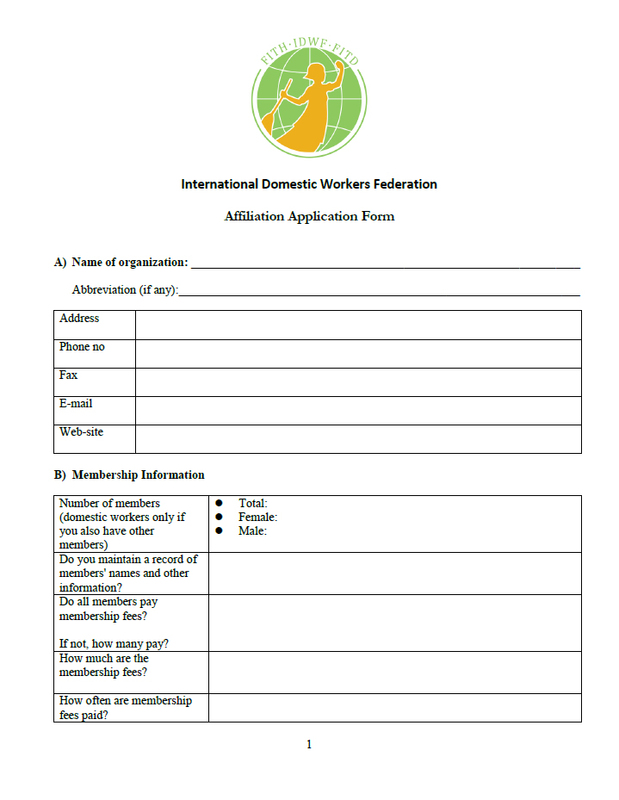 NDWF is composed of domestic workers unions from different states. SEWA is a trade union registered in 1972. It is an organisation of poor, self-employed women workers. These are women who earn a living through their own labour or small businesses. JALA PRT, National Network for Advocacy for Domestic Workers, with its domestic workers unions affiliates in Jakarta, Yogyakarta, Semarang and North Sumatra joined IDWF as affiliate. AMMPO is an association of overseas Filipino Workers in Malaysia, with the majority of members domestic workers. The Home Workers Trade Union of Nepal (HUN) was formed after the merge of the Nepal Independent Domestic Workers’ Union, Home Based Workers’ Union, Gold and Silver Ornament Workers Trade Union and Thanka artists Trade Union. UNITED is a national union of domestic workers in the Philippines. Local chapters are organized at barangay level nationwide. NHMC is a cooperative of domestic workers providing skill training and placement service for its members and at the same time to get domestic workers organized to advocate for their rights. The Network of Domestic Workers in Thailand organize both local and migrant domestic workers working in Thailand.